Electronics and Instrumentation, Second Edition, Volume 3: Probability and Information Theory with Applications to Radar provides information pertinent to the development on research carried out in electronics and applied physics. This book presents the established mathematical techniques that provide the code in which so much of the mathematical theory of electronics and radar is expressed. 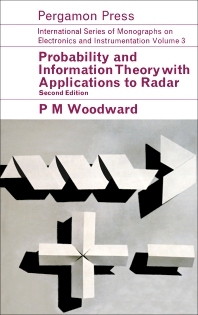 Organized into eight chapters, this edition begins with an overview of the geometry of probability distributions in which moments play a significant role. This text then examines the mathematical methods in electronics, which rest to an extraordinary degree upon the methods of time-and-frequency analysis. Other chapters consider the exponential dependence of the number of states on the number of units that immediately suggests a logarithmic measure of capacity. This book discusses as well the threshold of intelligibility that depends on the bandwidth of the transmitted signal. The final chapter deals with the simple applications of direct probabilities to radar theory. This book is a valuable resource for radar engineers.